Why? Another multimillion dollar scholarly work showing that the emperor has no clothes and that telomere research has been highjacked by what I have decided tonight to call the “Tire Tread Falacy of Car Maintenance.” I predict another 20 billion dollars and 20 years before the academics relinquish this horrible practice of using the size of the craters on the moon to determine what type of cheese it is made of. This is the latest study linking telomeres to disease (there are over 10,000) that once again falls victim to proving obvious yet useless information. In this study, they linked smaller hippocampal volumes (seen in Alzheimer’s) with shorter white blood cell telomeres in a subset of women with a genetic predilection for Alzheimer’s (the abnormal ApoE3 gene). 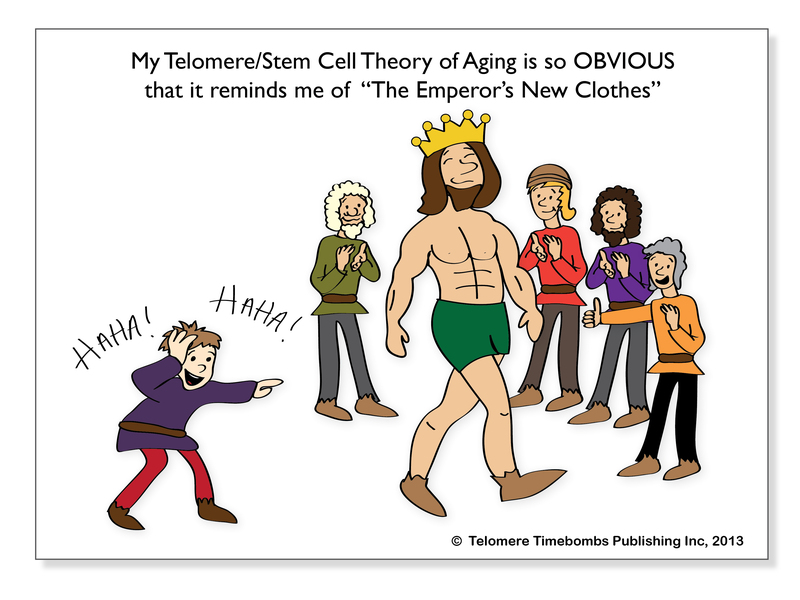 The reason I evoke the “emperor’s new clothes” is that my STEM CELL THEORY OF AGING says that all diseases are obviously linked to shortening of telomeres but no one sees it. What would I have done differently? First, we need to get away from the false dogma that leukocyte telomere length is a proxy for the telomere health of other cell types, in this case, the neural stem cells of the hippocampus. I call it the “Tire Tread Falacy of Car Maintenance”. That is the notion that because it is easy to measure tire tread without taking apart the car (just like it’s easier to draw blood than biopsy the organ of interest), that the tire tread will correlate with the aging of the pistons, electrical system, fan belts, etc. Nonsense. We need ORGAN-SPECIFIC studies of telomere health and maintenance; in this instance, a brain biopsy from the hippocampus of patients who died with Alzheimer’s versus those who died of other causes. And the scientists 10-20 years from now who finally do that study will hopefully measure white blood cell telomeres simultaneously and debunk the premise of this UCFS study. Personally, I suggest we stop looking at white blood cells to infer the aging of the neural cells or any other cells but unfortunately, no one cares what I want for telomere research yet. Any major dude will tell you one of the authors of this study has a Nobel Prize in Medicine and I’m just the kid with the chutzpah to suggest a naked emperor. But I hold that truth is independent of it’s source and so I’ll patiently wait for my honorary masters degree from UCSF ….in the study of the obvious!